Below is a list of spinal abscess verdict both in Maryland and around the country. We include both plaintiffs' and defense verdicts. This is a good sampling of cases and give you some idea of what is a case and what is not. But it is not a conclusive list. You will not be able to determine the value of your claim solely from this analysis. No two cases are the same. But this should provide real insight in the range of values for these cases. As you will see, there is no question that the verdicts in these cases are so large because the patients usually survive and have significant future care needs. 2015, Maryland. $1,240,000 Verdict. A 72-year old male is under the care of defendant urologist. He develops a fever, back pain, and staph infection and is admitted to the hospital. He is hospitalized for eleven days before being diagnosed with a spinal epidural abscess (SEA). He argues that if defendants had properly and timely diagnosed his condition, he would not have suffered permanent paralysis. The defense argues that the result would have been the same, regardless of the timing of the diagnosis. A jury awards the plaintiff $1,250,000. 2010, Maryland. A female complains of increased acute back pain at Montgomery General Hospital, and is discharged with a recommendation to have an MRI or bone scan if her symptoms persisted. She returns five days later, with severe back pain and lower extremity weakness. While at the hospital, she develops mid-back pain, abdominal pain, progressive paraplegia, fever, lower extremity weakness, and the inability to walk. She is transferred to George Washington University Hospital due to the worsening of her conditions, and is diagnosed with a spinal abscess on her thoracic spine. She has emergent surgery. She alleges she suffered injuries to her back, loss of bowel & bladder function, PTSD, depression, fatigue, and minimal ambulation as a result of the failure to diagnose her spinal epidural abscess. A jury finds that the defendants did not violate the standard of care. 2005, Maryland. A 54-year old female goes to defendants with alleged signs and symptoms of an epidural abscess. She argues that they fail to timely and properly diagnose her abscess, and fail to perform the proper diagnostic testing. The plaintiff argues she suffered nerve damage resulting in L5-S1 radiculopathy, permanent left leg impairment, pain, limited motion, weakness, and permanent back pain as a result. The defendants found that she failed to file within the statute of limitations, and a jury found for the defendants. 2016, New York: $2,000,000 Verdict. A 39-year old male with cerebral palsy goes to Hudson Valley Hospital with back pain. He is diagnosed with a back strain and is then discharged. Four days later, he returns with rib pain, back pain, and shortness of breath, just to be diagnosed again with a back strain. He returns the next day again, with tingling and numbness in his legs. He is admitted for pneumonia. It takes three days for him to be diagnosed with an epidural abscess with marked compression of his spinal cord. He alleges that the staff was negligent in failing to heed the signs of an epidural abscess and failing to timely diagnose the abscess. The defendants deny liability, and argue he was not experiencing symptoms of a spinal cord abscess during his first two emergency room visits, and that once his condition worsened the proper tests were done and the abscess was diagnosed. Plaintiff argues he suffers urinary incontinence and further damage to his spinal cord requiring future surgeries as a result. A jury awards the plaintiff $2,000,000. 2015, Pennsylvania: $12,500,000 Verdict. A 53-year old man goes to the ER with neck pain and tingling in his left arm. He is admitted to the hospital. His condition worsens as he develops a fever, urinary issues, and has trouble walking. The day after his admission, he is examined by the infectious disease specialists, who suspects an epidural abscess on his spine and orders an MRI. This is interpreted by the defendant radiologist as normal, without showing an abscess or fluid collection in the plaintiff's spine. The infectious disease specialist continues to have concerns about a cervical abscess and transfers him to a different hospital where surgery is done the next day. Plaintiff argues the delay of over 24 hours in surgical intervention allowed his abscess to put pressure on his spinal cord, leaving him permanently paralyzed in his arms and legs. The defendants argue that his condition was evaluated properly and that the radiologist stated the abscess was not visible on the MRI. A jury finds the radiologist and neurologist negligent, and awards the man $12,500,000, which includes $500,000 to his wife for loss of consortium. 2015, California: $3,570,000 Settlement. A 41-year old woman has a cervical discectomy, laminectomy and placement of a metal plate in her cervical spine. During this procedure, she is diagnosed with a MRSA infection, but is not given antibiotics or follow-up instructions regarding her infection. Five days later, she goes back to the ER, with ongoing neck pain and spasms as well as increased neck swelling and discharge. A CT of her spine is done, finding the "possibility of epidural abscess can't be excluded." However, no surgical exploration is done to see if there is an abscess. She is given antibiotics, but these are usually ineffective after an abscess has formed. Two and a half months later, she returns to the ER, with the classic signs of an epidural abscess causing spinal cord compression - her legs had given out and she had trouble urinating. She is admitted to the ER. The following week a CT myelogram is done, which diagnoses her cervical epidural abscess, and surgery is done to remove it. However, by this time the plaintiff has suffered permanent paraplegia. The plaintiff argues the defendants failed to transfer her to a major medical center who could handle the condition and caused a delay in removing the abscess resulting in her paraplegia. The parties settle for $3,570,000. 2015, Pennsylvania: $4,875,200 Verdict. A 52-year old female has a laminectomy procedure done and subsequently suffers a post-surgical spinal cord abscess. She contends that the doctors failed to promptly respond to her telephone call informing them of fever and drainage. She argues that they fail to diagnose and treat her spinal cord abscess before an irreversible injury occurs. The defendants claim they acted within the accepted standards of care. A jury awards the woman $1,500,000 for pain and suffering, $20,181 in past medical expenses, $2,825,565 in future medical expenses, and $531,454 for compensatory wages. 2014, Florida: $19,250,000 Verdict. A 36-year old woman goes to the ER complaining of an infected cyst on the back of her right shoulder. It is drained and treated, and the plaintiff is discharged with antibiotics. She returns two days later, with the same complaints. The wound is repacked by another physician. A day after this she goes to a medical clinic, and is told to go back to the ER for repacking of her wound and a surgical consult. She does this, and the wound is repacked, and a surgeon instructs her to come back for another appointment in two weeks. However, before the two weeks is over, she goes back to the ER with severe radiating chest pain. She is discharged. Two days later, she returns again with the same complaints of severe radiating chest pain, and she is discharged with medicine after a pulmonary embolism is ruled out, but no CT or MRI is done. She returns the same evening again and is admitted. Paralysis begins to set in. It is then discovered that she has a spinal epidural abscess originating from the infected cyst on her shoulder three weeks earlier. Surgery is done in an attempt to relieve the pressure on her spinal cord caused by the abscess, but she ultimately suffers permanent paralysis below the waist. She argues that the delay in treatment and admission to the hospital led to a delay in diagnosing and treating her spinal abscess, causing her paralysis. The plaintiff is awarded gross damages of $19,250,000, and her net award was $8,000,000. The parties settled while post-trial motions were pending. 2013, Virginia: $2,500,000 Verdict. A woman alleges that defendants fail to diagnose and treat her spinal epidural abscess and fail to order appropriate labs. She also alleges they fail to consult specialists to treat her sepsis. This untreated spinal abscess allegedly leads to septic shock, attendant cardiovascular collapse, and quadriplegia which leaves her to be ventilator dependent for the rest of her life. The defendants argue they treated her within the acceptable standard of care, but a jury awards the plaintiff $2,500,000, which is later reduced to $1,925,000. 2013, Ohio: $2,311,761 Settlement. An adult female suffers asymmetric tetraparesis (paralysis) leading to permanent injury and wheelchair dependency after defendants fail to properly treat her spinal epidural abscess. The defendants argue she was able to move around without a walker and can handle her daily living activities. The parties settle for $2,311,761 before trial. 2016, Virginia: An adult female goes to the ER complaining of pain in her upper back when she took deep breaths or when attempting to raise her arms. She argues that the defendants incorrectly interpret a CT of the abscess and fail to recommend an MRI. She is discharged, and has subsequent emergency room visits due to back pain, fever, an elevated white blood count, tachypnea (rapid breathing) and tachycardia (rapid heart rate). She argues that the defendants fail to do a second MRI, and that they misdiagnosed her complaints as a lumbar sprain, compression fracture, and arthritis instead of referring her to a prior specialist or admitting her to the ER. She alleges she suffered a spinal cord injury due to the spinal abscess in her spine which results in permanent paralysis due to the delay in diagnosis of the abscess. The defendants argue that epidural abscesses are uncommon and hard to diagnose in the early stages. A jury agrees with the defendants. 2015, New Jersey: A 56-year old man seeks care for severe back pain, nausea, and decreased appetite from defendants. Defendants order a spinal MRI, but do not follow-up with the plaintiff about the results, which plaintiff alleges reveal an emerging epidural abscess. The plaintiff alleges that they fail to treat his abscess and tell him about the severity and urgency of the condition, causing him to develop quadriplegia from spinal cord compression due to the delay in diagnosis of his spinal epidural abscesses. The defendants argue that they did refer him to a spinal specialist. The jury finds for the defendants. 2015, Ohio: A 75-year old female develops an infection in her right knee prosthesis, which is replaced. Shortly after this, she begins to have severe and worsening pain around her rib cage and upper abdomen. She is admitted to the hospital, where she alleges the doctor fail to properly examine her or order an MRI. An orthopedic surgeon examines her later, and finds a significant spinal abscess impinging on her spinal cord. She has surgery, but not until permanent damage had already occurred. She argues that she sustained permanent neurologic damage leading to wheelchair dependency as a result of the abscess being left untreated. The defendants deny negligence, and a jury aggress with them. 2015, Arkansas: 45-year old male suddenly experiences bilateral leg weakness and the inability to walk. He goes to the hospital, and it is discovered after an MRI the following day that his symptoms were caused by an epidural abscess compressing his spinal cord. He is transferred to another hospital, but not until after the abscess causes permanent damage. He argues that the defendants failed to properly diagnose his condition and failed to order an MRI promptly. The defendants argue that the epidural abscess was rare and didn't appear as a typical one would, and further that the actions the plaintiff suggests should have been taken were not reasonable. A jury agrees with defendants. 2013, California: Plaintiff complains of a pimple, which is cultured and found to be an MSSA infection. Plaintiff is given antibiotics. 20 days later, plaintiff goes to the ER complaining of pain, and is diagnosed with sciatic and a resolving buttock abscess, and is discharged. He awakes later, unable to move his lower extremities. An MRI shows an abscess causing spinal cord compression. He files a claim alleging that the defendants failed to timely diagnose and treat his abscess, and defendants argue that the buttock and spinal infections were separate infections. A jury finds for the defendants in that they were not negligent in treating or diagnosing the plaintiff. As you can see from these verdicts and settlement, some cases are better than others. Let's talk about what these cases are about and what makes for a stronger case on liability and damages. A spinal epidural space infection is a medical emergency. Epidural abscesses are emergencies because the longer the infection persists in the epidural space, the more damage to the the spinal cord. By the minute, there is a reduction in the blood flow to the nerve fibers that make up the spinal cord. Certainly, in terms of winning on liability, SEA cases where the victim had all of the classic symptoms -- fever, leukocytosis (elevated white blood cell count), and persistent and severe localized pain -- are going to have a better chance for success at trial or a great settlement. The murkier the symptoms, the less the chance of success. Cases that result in significant motor weakness, sphincter disturbance, or paralysis are going to have real trial and settlement value. If you have suffered as a result of the negligence of a doctor or hospital, Miller and Zois can help you. You are entitled to justice and compensation for the harm that has been done to you and your family. 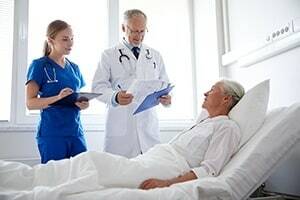 Miller & Zois has a long history of getting results in medical malpractice and nursing home cases in Maryland, earning large verdicts and settlements. Call us today to speak to a medical negligence attorney who can help you, at 800-553-8082, or get an online case review for free.